iPad 4 is 9.4mm (0.37 inches) thin and weighs at 1.44 pounds (652 grams). Like its previous versions, iPad 4 is 9.5 in height and 7.31 in width. 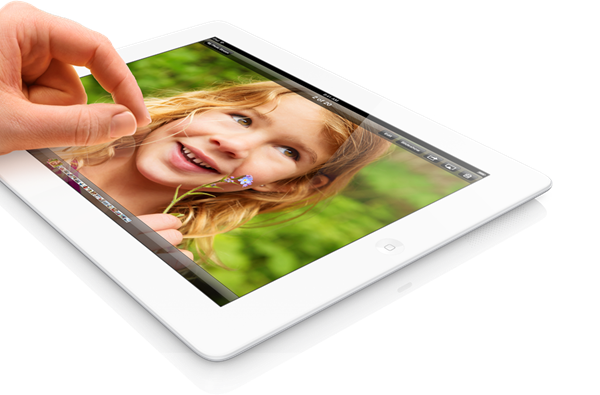 iPad 4 features 9.4 inches Retina Display. Screen resolution is double than that of iPad Mini / iPad 2. The iPad 4 comes in 2 versions, WiFi only and WiFi + Cellular. Both have WiFi and Bluetooth 4.0 and the Cellular version has LTE, UMTS, CDMA and GSM / EDGE connectivity. Like iPad Mini, iPad 4 has 5 Megapixels iSight rear camera with autofocus & 1080p video recording plus a front facing 1.2 Megapixels camera with 720p video recording.